Here at Ballard, we are committed to bringing you the thoughts and voices of leading experts in the hydrogen technology space. A special topic of interest is hydrogen distribution, which is an essential element in the successful adoption of zero-emission fuel cells. Recently, Ballard hosted the Fuel Cell Electric Bus Conference Event in Copenhagen, Denmark in partnership with Nel Hydrogen, Hydrogen Valley, the Danish Hydrogen Association, and Solaris Bus & Coach. 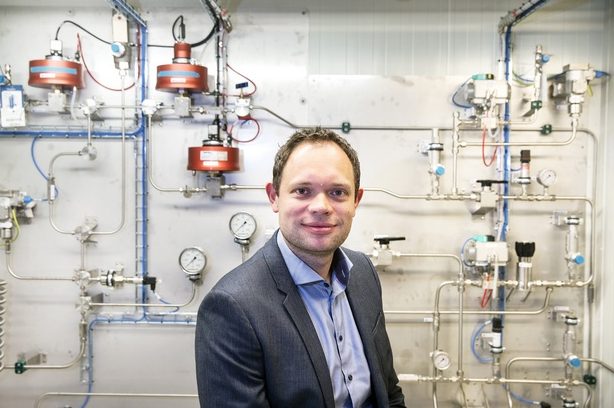 After the event, we had the opportunity to sit down with Jacob Krogsgaard, Head of Nel Hydrogen Solutions to discuss Nel’s role in the current growth and future of hydrogen technology. Nel Hydrogen Solutions is an organization dedicated to providing optimal production, storage, and distribution solutions for hydrogen made from renewable energy. Mr. Krogsgaard is also one of the co-founders of H2 Logic. What is Nel Hydrogen’s reason for being? Nel’s ambition is to make hydrogen fuel that is both zero-emission and zero-compromise. Zero-emission is the standard by which all future vehicles should be designed. True zero-compromise means the hydrogen is produced from renewable sources. That’s what we are doing in the majority of the projects we are involved with. Can you tell us about the hydrogen products that Nel offers? Nel focuses on producing electrolysers and hydrogen stations. Naturally these two products go hand in hand. Electrolysers take electricity and produce hydrogen out of it. Hydrogen stations compress, store, and control gas before it gets fuelled into cars, buses, trucks, or trains. Nel is the world’s largest manufacturer of electrolysers. We typically include and build them right next to the renewable energy sources or connect them to the electrical grid, where they can operate when the grid has electricity. An example of this is a 20-megawatt electrolyser we are working on in Denmark that will be grid connected. The Public Service Obligation (PSO), a national entity that is in charge of balancing the electrical grid, will be sending signals letting us know when to turn the electrolyser on and off depending on how much wind power there is in the grid. Basically, that is the greenest you can do it. How can hydrogen help address the availability and efficiency challenges of wind energy? In Denmark, almost 50% of all electricity comes from wind power. However, the energy that can be captured from wind fluctuates throughout the year. When the wind is blowing, there can be more than 100% availability but much of that energy might not be captured, resulting in an inefficiency in harvesting it. When the wind is not blowing, we have a deficit, and we then have to buy the energy from our neighbouring countries. Having the possibility of taking the surplus electricity, converting it into a green fuel as energy storage, and then using that zero emission fuel to power transportation and industry creates real value to the existing infrastructure. If someone installs a hydrogen system, are there limitations to the capacity that you can provide in a day? Yes, of course there are limitations to the system. A fuel cell is rated for the number of kilowatts per hour. Our fuelling stations are typically rated in a number called kilograms of hydrogen produced per day. You have different sizes of fuel generation stations depending on what you need them for. What is the capacity of a system you would install at a transit system fuel depot? How many buses or vehicles can it support? That would be on a kilogram per day basis, and that converts to buses. Somewhere around 20 to 30 kilograms per bus multiplied by the number of buses. The smallest unit we have for transit agencies is for fleets of 10+ buses per day and then we scale up from there. To some extent, it also depends on the fuelling protocol of the bus operator. If they want to fuel all of the buses one after another, they would need a bigger station. If they are able to have a gap of 15 to 20 minutes between fuelling, a smaller station would work out. The way it works is that you have a station with compression, cooling, and control. You can imagine that whenever you are done with a fill, there is a buffer that needs to be refilled. The compressor is running to fill the buffer and the quicker you need bus number two to arrive, the quicker you need your buffer to be filled and that increases your capacity. That is the simplified version but there are many more details behind it. What changes need to occur in the industry to make hydrogen more viable as a fuel? Fuel the hydrogen into a fleet of fuel cell electric vehicles. This happens when hydrogen fuel has the same cost per kilometer as diesel and/or gasoline. Currently, the fossil parity cost is five euros per kilogram of hydrogen in Europe - and this is exactly what Nel Hydrogen Solutions is aiming to achieve. What are some of the challenges you are encountering as this technology gets built out? The greatest challenge is not the technology, because that is proven. The fuel cells, fuelling stations, and electrolysers are all proven. The issue is the volume. What we are missing is the scale for business - we need to scale and convince partners. Demonstration is fantastic, but we need to step out of the shade beyond demonstration and into commercialization. We need to talk about buses in the 100’s, not in 10’s. This will change everything. The H2 Mobility and Consortium has a plan to build a German-wide network of hydrogen refuelling stations by 2020. Can you speak to this initiative and how other jurisdictions can learn from what they are doing? What they are trying to do is share the burden. Building a network of hydrogen stations while not yet having cars on the market is a costly process. All the parties realize that it is costly. No one wants to be a first mover, because the first movers are at a disadvantage when they invest in infrastructure that is not currently being used. They need to find a way to share the burden. To do this, oil retailers, gas companies, and Mercedes have joined forces to work together in developing the infrastructure. What other jurisdictions are establishing standards for the hydrogen economy? What we see happening in California is very encouraging. The policy makers have implemented a zero-emission vehicle mandate. The OEM’s receive penalties if they are of a certain size and don’t provide zero emission vehicles. That is a policy that is working and actually the OEM’s are also investing in the infrastructure. Is the same type of policy happening in Northern European Countries? In Northern Europe, tax exemptions are available for cars. Currently, traditional gas and diesel-powered cars in Denmark and Norway have around 150% tax. That is a lot for these types of cars, but there is actually no tax on fuel cell cars and very little tax on battery cars. However, this is still not moving the sale of cars as the manufacturers are still selling them at too high of a price. What advice would you give to a policy maker about building out a hydrogen network, other than tax incentives at the vehicle level? I would advise them to start putting penalties on the vehicle manufacturers, to not just talk about policies but walk the talk, like they are doing in California, Japan, and Korea. In some places, like Ohio, there is a reasonably active fuel cell network for buses and they are actually sharing the fuelling stations with the local community of hydrogen fuel vehicles. Getting such an infrastructure up and running then has a domino effect on the car side. Basically hydrogen will be available and the station owners do not need to wait for a long time, because stations are utilized for cars and you can potentially use the same stations for both cars and buses. In Riga, Latvia for both buses and cars. And as hydrogen technology evolves, we are going to see increased demand, more vehicles, and hopefully the network will become further developed. When we get to that point, we will be happy. Competition will start, and the right market forces will come into play. We can then stop bugging politicians to get support and will be able to run a commercialized business. That’s where we all want to get. Your future is in the hydrogen economy. What are your predictions for the growth of your company and growth of the hydrogen market? So we have talked about fuel cell cars, and that’s all fine, but that’s not what’s going to make the business grow. What will is the heavy-duty industry - buses and trucks. Because there we can have sufficient volume and quantity that can make the business fly much faster. By focusing on heavy-duty vehicles, especially buses, we can hit critical mass. We have bus manufacturers that are motivated to run, not just in Europe, but in Asia and to some extent in the US. Some of these are city buses that drive in the inner cities, where we have issues with emissions and particles. So that is actually putting the efforts where they are needed the most. We have known Ballard for more than 12 years, and we are completely aligned on what we are doing. We are dedicated and hydrogen is our business - not that there are many of our kind of company around. Ballard wants to make fuel cells and fuel cell systems work, along with the vehicles, while making them as cheap as possible to further commercialization. And Nel does the same with fuelling. While we have recently joined forces, we can see that together we are thinking big, not small. Think big and the hydrogen business will work. Think small, and the hydrogen business will die. Discover why fuel cell buses are the best zero-emission solution for Scandinavia's public transit.